If you are looking for the best wood floor cleaner and you aren’t sure where to start, you don’t need to look any further. In this guide, we will take a look at four popular machines that are specifically designed to clean your wood floors and leave them looking shiny and nice for many years. The Hoover FloorMate FH40160PC may prove to be the best wood floor cleaner for several reasons. To begin with, this unit has special SpinScrub brushes that wash and scrub your hardwood floors at every angle in order to provide a complete cleaning solution. There are two tanks on this cleaner, so clean and dirty water will stay separate, thereby ensuring that your floors stay clean. Since this machine can hold 1.5 quarts of water in the tanks, you won’t need to make nearly as many trips to the sink to get clean water as you would with a standard machine. There is an 11.5-inch nozzle on the unit that gives you a combined squeegee and suction power to help dry your floors quickly and efficiently. Finally, the 20-foot power cord helps you cover a lot of ground without constantly needing to change outlets. Real reviewers on Amazon.com say that they like the fact that this machine works on many different floor types. Users also like the overall design of this particular model. Anyone looking for the best wood floor cleaner on the market may want to consider the BISSELL Total Floors 2949. This particular machine is designed to vacuum and mop your floors while leaving them dry so that you don’t have to let them air dry. Since this unit performs all the basic functions in one, you don’t have to worry about purchasing separate machines to do each individual job. This device is very lightweight and easy to use, so you can maneuver it around your house in an efficient manner without getting tired, and you can easily operate the controls on it. In fact, this particular machine is 40% lighter than a standard hard floor cleaner. You don’t have to worry about damaging your floors with this device, because it is built to work on hardwood, vinyl, ceramic, linoleum, and many other floor types. Amazon.com reviewers say that they like the high levels of versatility that this machine offers. 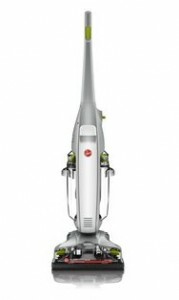 Users also like the fact that this unit provides three different functions in one machine while being several times lighter and more affordable than the leading hard floor cleaners. The Hoover WH20200 can easily be considered the best wood floor cleaner because of its ability to work on all floor types. This device is designed to kill 99.9% of germs and bacteria that may be present in your hard floors or carpets. There are twin tanks on this unit that allow you to clean using water or special Hoover cleaning solution, depending on what your preferences are. You can adjust the control dial on the unit depending on the amount of light or heavy cleaning that you have to do. There is a special indicator light that tells you whether or not the machine is turned on, and it has a carpet glide function so that your carpets can be refreshed and cleaned with ease when you transition from your hardwood floors. Finally, the triangle-shaped head makes it easy for you to maneuver the unit around every area of your home, and you can also get into those hard-to-reach places that standard machines tend to miss. According to popular Amazon.com reviews, users like the fact that you can use this machine on almost all floor types—including carpets. Users also like the high-temperature steam that comes out of the machine, as this gets deep into your floors to clean them in a way that other machines cannot. If you are trying to find the best wood floor cleaner on the market, then you may want to consider investing in the Haan SI-35. 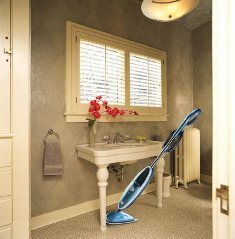 This unit is a very slim, lightweight steam cleaner designed to get into the tighter areas of your home that are traditionally missed by other steamers. For instance, this model does a much better job at getting underneath furniture and appliances than other models are. This means that more areas of your home can get cleaner faster than they ever could before. 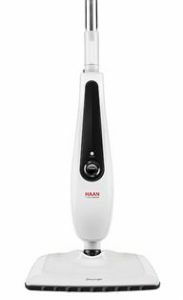 This particular steam cleaner will remove 99.9% of any bacteria that may be present in your floors, and it runs at 1200 watts, so you can rest assured that it is exceptionally powerful. The 19.5-foot power cord also provides you with enough length to clean a given area of your home without worrying about having to change outlets every few minutes. When you purchase this cleaner you get 2 microfiber pads for your hard floors, a special floor protector pad, a gliding tray, and a manual. Users like how quickly the water heats up in this unit to produce steam. Users also like the fact that you can use this on linoleum and hard floors without a problem. Are you trying to find the best wood floor cleaner on the market? If so, then one of the above four models may be the perfect choice for you.